Not sure about your job future? What is the future of software engineering jobs? What should you learn to secure your job in the future? What are the trending job opportunities? Searching job and employment have become the biggest concern, today. I come across many geeks those are looking forward to starting their career in the software industry. When they ask me about the required skill set for getting enrolled in software developer jobs, I prefer to ask them to learn programming languages. There is a huge number of programming languages, you just spell it and it is there. You can find the list of programming languages on Wikipedia. 99% of programming aspirants end up after fumbling over choosing the right programming language to start. Why should you know, which programming language you should learn before starting? Choosing any computer programming language and getting started is just like digging wells in the desert. You must have the vision and future scope to utilize your programming skill in various software developer jobs. In an intention to help programming aspirants, I am elaborating my opinion on choosing the right programming language by considering future scope in the software industry. If I look at the current scenario and future requirements from various big IT firms, we will need 3 types of the programmer in great numbers for Software Developer Jobs in Future. This category includes all programmers, those study machine learning, predictive analytics, data analysis and finding patterns. Data analysis has become the backbone of the various trending tech topics such as Bigdata Analysis, Internet of Things (IoT)… Data analysis is also carried out at the back end to predict the future scope and trends in the market. Do read the fact behind the big data growth. It does not corporate any kind of database activities. Here, major technologies are NoSQL databases, Spark/Ignite, Python, R, Julia and similar. There are many Python libraries are available for data science. Python is the most useful programming language for data parsing and manipulations. Let us see what is the Learning System? Learning system includes gathering all the required information, processing and building response over it without human interaction. As it builds response according to the processed data, this has become very important. Artificial Intelligence (AI) is the best example where “Learning System” provides a vital role. Driverless vehicles radically based on the Learning System. Despite having many pros and cons of utilizing AI in real life, there is a huge scope in AI for software developer jobs. For example, driverless vehicles radically based on the Learning System. I must say, there is huge scope in AI for software developer jobs. I must say, there is huge scope in AI for software developer jobs. It includes neural nets, probabilistic generative models, K-R (Knowledge representation), and similar. C#, Python Scripting, and Lisp programming are used by the programmer to understand “Learning System”. To carry out any transaction over the internet, security becomes the extreme interest. The transaction includes online payments as well as it includes anything that has to transfer the data from one place to another in a very secure and reliable way. Though every transaction should endorse ACID properties in DBMS, security is the biggest concern. To carry out any transaction, there are many transaction tools are available. It also includes Online Analytical processing (OLAP), map reduction and other transaction-related technologies. If you have read carefully, Python programming falls under all the above category to work on. I am working on Python for one of the projects and I think it is the most simple and elegant for data analysis and manipulation. Do your own analysis of the requirement in the future of software engineering jobs. Find the place where you want to explore yourself. Choose the right programming language that suits your need and start adding fuel to your programming skill. I am sure it will be paid off, the day after tomorrow. If you have any doubt, feel free to use the comment section below. I am more than happy to discuss and know your opinion. I am Abhishek from Haryana. I am studyng in UIET, Kururkshetra University. I am in 4th sem of B.Tech Computer Science. I really want to know which language or what type of summer training should i do.!! Hi Abhishek, Happy to see you here! I have worked on both Java and Python. If you are confused over choosing one, you must have to consider pros and cons of both languages, scope in the software industry. Java is widely used for website designing and to develop android applications. Python is mostly used for data analysis and data parsing, bigdata processing. It is getting the huge scope as market is getting more data driven. But when you put the glance over the competition to fulfil the requirement of software developers in MNCs… you can find Java developer everywhere… But big MNCs are still looking for Python experts. So I would like to suggest you to go for Python. Regarding summary training, try to get the summer internship in MNC. it will give you hands on working on live project. Working on live project and learning is always adds more value than just reading and learning. You can join CSEStack Expert Group On FB to head on more coding topics. Req. Now as i just joined Ericsson few months back and still on the track to assign some work , meanwhile i am planning to use that time to learn something which can help me in future to get good job . 3.) 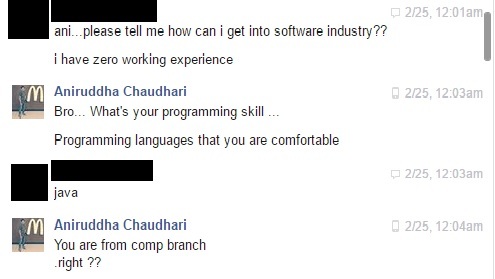 or i can learn Python , But i don’t have any work experience in Python . So is it helpful for me to get better opportunity in future ? Without considering your experience, if you ask me to choose one, Python is the best choice, among all your choices. But again as you have experience working on the shell script, you can master it. Nowadays, Scripting languages are mostly used for automation and have lots of buzz in the IT industry. In that case, Red hat certification really will add value for your career. Meanwhile, learning Python is not much tough, at least to begin with. So you can dabble in it. Even if you master any one technology, it is always good to have basic knowledge of others technologies in your cap. Thanks for this article, really an informative one. I am currently in my 4th semester and I am interested in AI. I am a beginner in python programming. Could you please suggest me some good resources from where I can start learning about AI? Thanks for your kind word. I would suggest exploring Tensoflow which open source library by Google. It is also available as Python module. If you are new to the artificial intelligence you can opt for Udemy or Coursera online courses. (Check the reviews and sample videos before choosing any of the course online.). What can be the best way to learn Python, for job perspective. I am currently doing Python courses from Datacamp and coding practice from HackerRank. I have 5+ IT experience and currently working in IT process Automation project. But, there we do not use Python. I want to switch job in Machine learning project. So how I should study to land a job in machine learning. Any suggestion from your side will be helpful. Its great to see you here and your willingness for Python learning. Looks like you have good working experience. As a start, if you are interested in Machine Learning, along with wrestling all basic Python concepts, I would recommend you to explore Python libraries for DS and ML. Here are some quick links you can explore and connect with me.